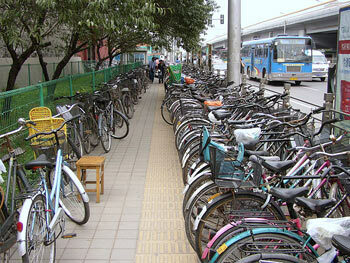 Once known as a nation of bicycles, China today has a growing number of private car owners. Still, you are guaranteed to see more bikes than anywhere else in your life. Exploring Beijing on a bike is excellent since the city is flat as a pancake, and all major streets have bike lanes. Bicycling is often faster than car, taxi or bus because of the traffic congestion in the motorized traffic lanes. Four-wheeled motorized traffic in Beijing usually observes traffic signals with the exception of making turns on red lights which is often done without slowing or deferring to pedestrians or bicyclists. Pedestrians, bicycles and all other vehicles (for example, motorized bicycles, mopeds and tricycles) generally do not observe traffic signals. Also, cars, trucks and buses do not defer to bicyclists on the road so it is common for a vehicle to make a right turn from an inside lane across a bike lane with no concern for bicyclists traveling in the bike lane. Sometimes a right-turning vehicle crossing a bike lane will sound its horn as a warning, but not always. Bicyclists also need to be on the lookout for wrong-way traffic in the bike lanes, usually bicycles and tricycles but sometimes motor vehicles, too. Wrong-way traffic usually stays close to the curb so you move to the left to get by them, but not always. Helmets are not worn by bicycling Beijingers. Nor are lights used at night with few bikes even having rear reflectors. The moderate pace and sheer numbers of bicyclists in Beijing appears to make bike travel safer than it would be otherwise. While you will see bicyclists use many creative paths across wide, busy intersections in Beijing, the safest way for bicyclists is to observe the traffic signals (there are often special signals for bicyclists) and to make left turns in two steps as a pedestrian would. But if you spend any significant amount of time bicycling in Beijing, you will probably start adopting more creative approaches. These can be learned by finding a local bicyclist going your way and following him or her across the intersection. Several professional bike rental companies, as well as major hotels and some hostels, rent bikes on an hourly basis. For those who need the security of a guide, a bike touring company like Bicycle Kingdom Rentals & Tours (http://www.bicyclekingdom.com/) would be a great way to go. If you are staying more than a few days a reasonable bike can be bought for 300 yuan. Ensure that you have a good lock included in the price no matter how cheap the bike as I have seen even a $10 bike disappear from local bars. The cheapest bikes are not worth the additional savings as you will get what you pay for. The cheapest bikes will start to deteriorate as soon as you begin to ride, so spend a little more and get a bike in the 300-400 range. I am sure that you can get a bike for less, but I got a "Giant" brand bike with a heavy duty lock and basket for 350 yuan. Bike rentals may have good bikes, but you pay a high price and run the risk of the bike being stolen.